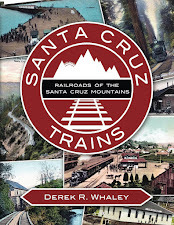 The port of Santa Cruz has been blessed with three Railroad Wharfs throughout its history. One of these was converted, while the two others were built specifically for the purpose of hauling rail freight out onto the waters of Santa Cruz harbor. 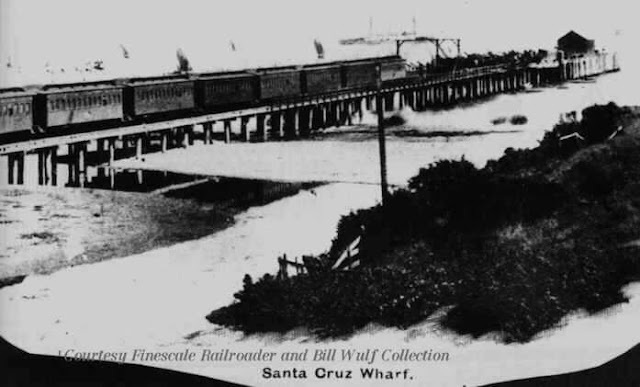 Over the years in Santa Cruz, the wharfs served other purposes as well and today, the one surviving wharf does not serve railroads at all. This map at right shows an overview of all six piers (or partial piers) that have existed between Lighthouse Point and the San Lorenzo River. The Connecting "S" Wharf was never anything other than a bridge, while four of the pier were always known as wharfs despite failing to meet the definition of a wharf. 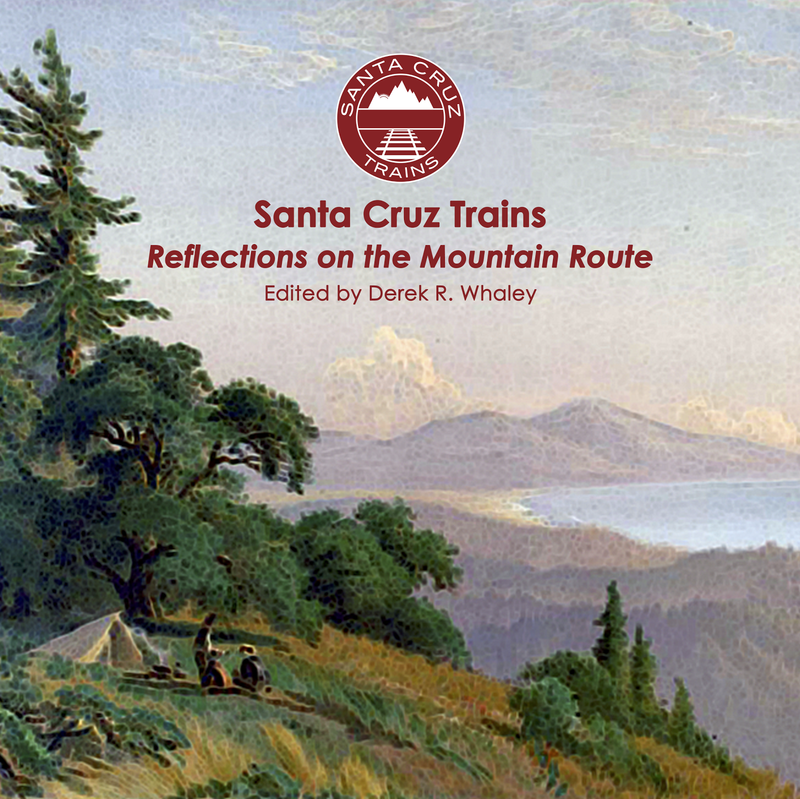 In any case, these relics provided for much of the wealth of Santa Cruz in its earlier years. 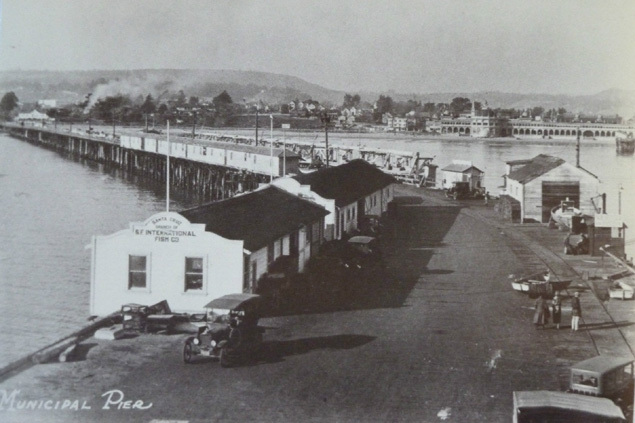 The South Pacific Coast Railroad Wharf was an enigma until recently. For about sixty years, it was thought to be the same as Gharky's wharf, but recent evidence from the crew at Lime Kiln Legacies has revealed that the original railroad wharf was built in 1875 specifically for the Santa Cruz & Felton Railroad which was purchased by the South Pacific Coast and connected to San Francisco in 1880. The new wharf was completely done by 1876 to allow the transfer of goods, specifically lumber, from trains onto waiting steamships. The tracks ventured all the way to the end of the wharf. 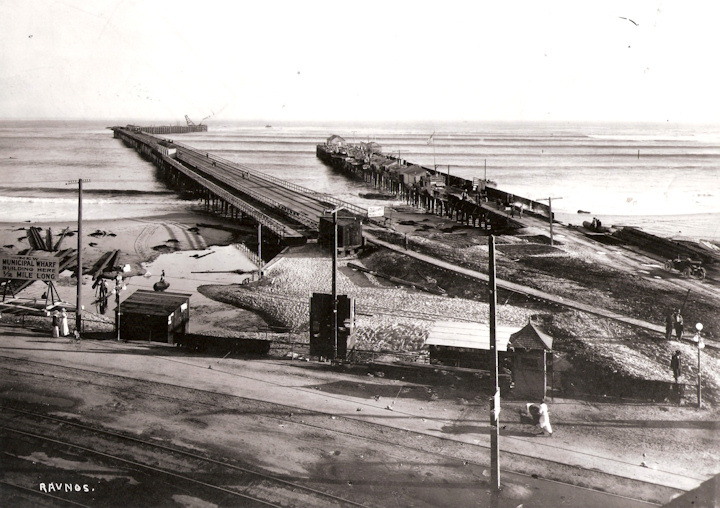 This railroad wharf was demolished in 1922 after the second, and current, Municipal Wharf was constructed. The old Railroad Wharf continued to be used for eight more years in the capacity of a sardine cannery, though its tracks had been lifted sometime between 1914 and 1916. The photograph below shows a rare glimpse of the wharf from during the few years that it was the only freight pier on the waterfront. The photograph below shows the old Railroad Wharf in full use at an unknown date. A full passenger train is heading away from the pier with a ship barely visible in the background. It is likely that the ship just unloaded passengers and is now heading back toward Santa Cruz. 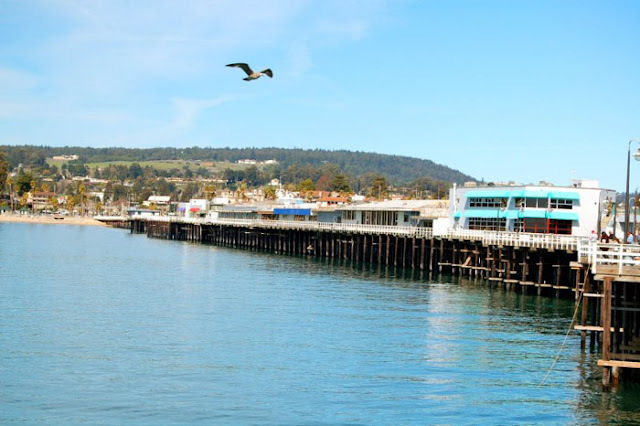 The oldest wharf in Santa Cruz was next door, popularly known as Cowell Wharf, protruding out from where the Sea & Sand Inn now sits atop West Cliff Drive and Bay Street. It was owned and operated by the Henry Cowell Limeworks, though it was built in 1849 by Elihu Anthony, one of Santa Cruz's founders, and purchased by Isaac E. Davis and Albion P. Jordon Limeworks. Cowell took over operations from Jordan in 1865. The only tracks on this wharf were for internal use and shipping, and they were not connected to the mainline. The wharf was destroyed in a storm in 1907. Pilings from the wharf survived off the coast of Cowell Beach into the 1940s. In the photograph below, taken in 1906 just a year before Cowell's wharf would disappear, the pier in the center is the old Railroad Wharf, two decades after its neighbor, the Powder Works-owned Steamship Wharf, disappeared. In the foreground is Cowell Wharf. In the distance, the black blur on the water is the Boardwalk's Pleasure Pier, which paled in length to the other two piers. Gharky's Wharf was built in 1856 by David Gharky without the intended purpose of hosting trains. It had its base at Main Street and branched into the location of the current wharf. In 1858, it was lengthened to allow large ships to moor off the pier. In 1865, the California Powder Works purchased Gharky's pier so they could use it to store and ship black powder being produced by the California Powder Works, located at the mouth of San Lorenzo Gorge where Paradise Park Masonic lodge is located today. The CPW was the only California powder works company and provided virtually all the munitions for the West Coast during the war. It became known as the Steamship Wharf after the war due to the leasing of the pier by the Pacific Coast Steamship Company. The wharf was extended in 1869. In 1877, the Steamship wharf was bridged to the Railroad Wharf with an interesting S-shaped Connecting Wharf that allowed a railroad to cross between the two, since the Steamship wharf never had its own tracks until this linkage. The Powder Works company paid for the bridging wharf and construction took only a few months. By 1882, the California Powder Works had agreed to a deal with the South Pacific Coast to ship their black powder directly using SPC lines rather than their own equipment. The Steamship Wharf was demolished that same year, as well as the Connecting Wharf, because neither were no longer necessary for operations. The CPW worked exclusively with the SPC and the costs of maintaining its own pier were becoming too high to justify. The photograph above is the only known photograph showing the connecting wharf, and it is rather difficult to see. About half-way down the foreground wharf, a small little bulge appears which runs into the more distant wharf. That was the bridge between the two. In the immediate foreground, a line of track runs from the Cowell Limeworks freight sheds to the wharf, which begins its descent at right. The etching above shows an artistic rendering of the 1877 to 1882 bridge between the Railroad and the Steamship wharfs. It was truly an "S" shape and connected them so that the Steamship Wharf could have rail service. Cowell Wharf is also visible at left. Cowell utilized railroad tracks to transport freight down the steam incline to the waiting ships below. This track was never connected to the main rail line. 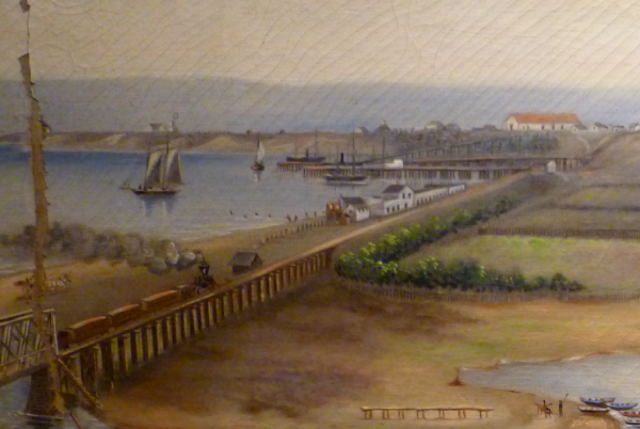 The painting below shows the Santa Cruz harbor before the railroad wharf was built, with the Powder Works Wharf at center with two ships moored at its end, and Cowell Wharf at left with another ship beside it. The California Powder Works processing plant was located at the top of Beach Hill, as is shown in this photograph. The 1914 Municipal Railroad Wharf was built immediately beside the Railroad Wharf to act as a replacement and to allow larger steamships to use the site since no deep-water ships could adequately utilize the existing piers. The tracks to the Municipal Wharf split from the old Railroad Wharf and the Beach Street line somewhere near the Howe strut bridge at West Cliff Drive. Both the wharf routes went under the bridge from the beginning while the beach tracks went down Pacific Avenue for a while. In this photograph, the two piers can be compared in good detail, showing their close proximity and the significant length of the Municipal Wharf at left. By the time this photograph was taken in 1913, the old Railroad Wharf was a very busy place with buildings lining the left side while the tracks controlled the right. The Municipal Wharf was immediately adopted by the local Italian families as their new home. The photograph above, taken in the 1920s, shows the tracks running along the right side with smoke from a train near the base of the wharf and the Boardwalk in the distance. Most of the businesses on the wharf were run by local Italians, though the San Francisco International Fish Company is the only readable company here. The Municipal Wharf still survives today but not as a railroad wharf. The photograph at left shows it a number of years after the tracks were pulled, with businesses visible in the foreground and in the background near the end of the pier. Cars are parked where now there is a traffic intersection. The pier is the same length as it was when it was first built, but it has been widened considerably over the years. There is only one pier in Santa Cruz now. It is the Municipal Wharf and it still is home to a lot of Italian fishing families, but no trains. The train skirts by on its old route been then turns toward the Boardwalk, almost entirely bypassing the place where it once could continue straight onto the pier itself. The wharf is a fun place to check out still, but its use is long used up and today it serves mostly as a home to expensive restaurants and curio shops.